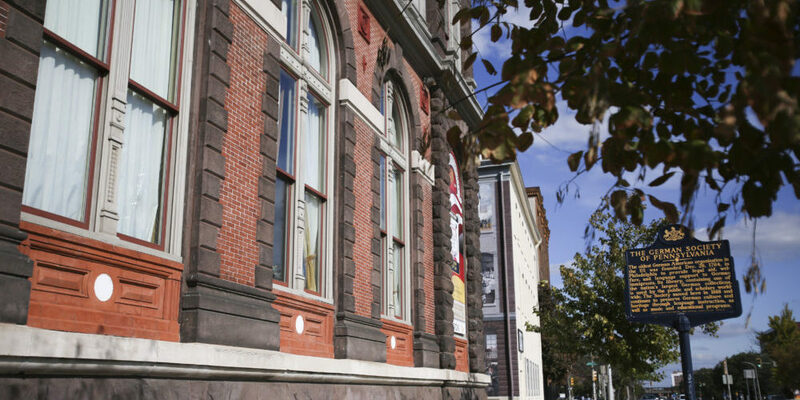 The beautiful three-story building at 611 Spring Garden Street consists of the front building that includes a great auditorium/concert hall with world-class acoustics, the large classic Horner library, language classrooms, a cozy Ratskeller; and a townhouse that contains offices, conference rooms and storage. Our presence on Spring Garden dates back to 1887 when the Society purchased a lot that included the present townhouse (built in 1829) for $28,000. An additional $32,600 was spent for renovations and the front building that opened in 1888. Our various programs and activities use all of these facilities. Moreover, the historic premises are also well suited as a venue for weddings, conferences, receptions, parties, business meetings and similar events; the building is a community resource. A major library renovation project was successfully completed in 1999. Other parts of the building have undergone substantial repairs and several upgrades in recent years, some to meet current safety standards. -Installed a wet sprinkler system in critical parts of the building, and a five-stop elevator. -Replaced badly deteriorated windows in the Directors Room and the Auditorium, and repainted and replaced drapes in the latter. -Renovated and upgraded the 2 basement bathrooms and added a handicapped accessible facility. -Replaced the front entrance including the great door, its framing, and windows above it; and subsequently refurbished the entrance area and installed a new ceramic floor. -Completed a major project to prevent water intrusion around most of the foundation.